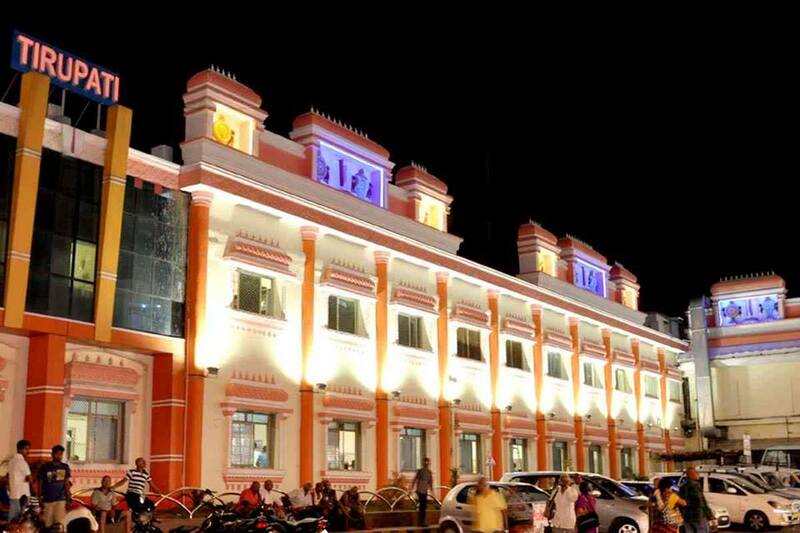 Tirupati Railway Station has been awarded Gold Rating by Indian Green Building Council (IGBC). The IGBC-CII, with the support of Environment Directorate of Indian Railways has developed the Green Railway Stations Rating system to facilitate adoption of Green Concepts, thereby reducing the adverse environmental impacts and enhance the overall commuter experience. The rating system helps to address National priorities like water conservation, handling of waste, energy efficiency, reduced used of fossil fuel etc. 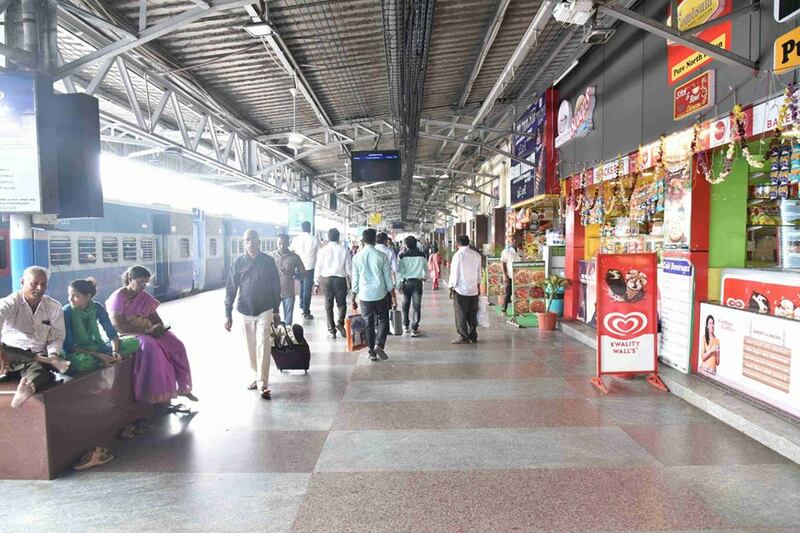 Passenger Amenities at Railway Station: The station is equipped with all essential Passenger Amenities like Foot over bridges, Lifts & Escalators. 3 Lifts & 4 Escalators are provided covering all platforms, 2 FOBs, Snack Kiosk & Drinking Water points are available at station for passengers. Porters are available with on duty TTE, who will assist the passenger up to coach and for movement of wheel chair into coaches by using a light weight foldable ramp. The station has 100% outdoor lighting fixtures installed with LED lamps. Safe Drinking water facility: The potable drinking water facility is available at all platforms of the station for passengers, through piped water supply connection. Adequate quantity of Clean & Safe drinking water conforming to IS 10500 is being supplied in Tirupati station. In addition, 7 RO water vending machines are also available covering all platforms for providing purified drinking water. Periodic check on quality of water is done at authorized laboratory by health department. Solid Waste Management Plan: The station has provided two separate bins for collection of food waste (Organic) and recyclable waste (plastic & paper) at every platform at an interval of 30mtrs. Black & green colored covers for wet & dry waste has been provided on bins. Plastic-free Environment: Awareness initiatives like pamphlet distribution, Signature campaign, Nukkad Natak, Rally have been conducted on World Environment Day, Swachh Bharat. Also, station authority has prohibited plastic bags within the station premises and snack kiosks are informed not to give plastic bags for the purchased snacks. Enhanced Indoor Air Quality: Station has installed CO2 sensors integrated with exhaust fans, thus meeting the intent of having a control system to maintain a differential CO2 level of 530 ppm in all Air-Conditioned rooms which are the densely occupied areas in station. Daylighting: Majority of spaces have good access to daylight. The measured lux level at waiting halls (general, sleeper, ladies & AC) and VIP lounge are having more than 110 lux through day light. Station Housekeeping Plan: The station is using housekeeping chemicals that meet ecolabel certification (GreenPro/ Green seal certified or equivalent Type I ecolabel), for credit compliance. Green certified housekeeping chemicals are being used for station housekeeping and for OBHS cleaning services. 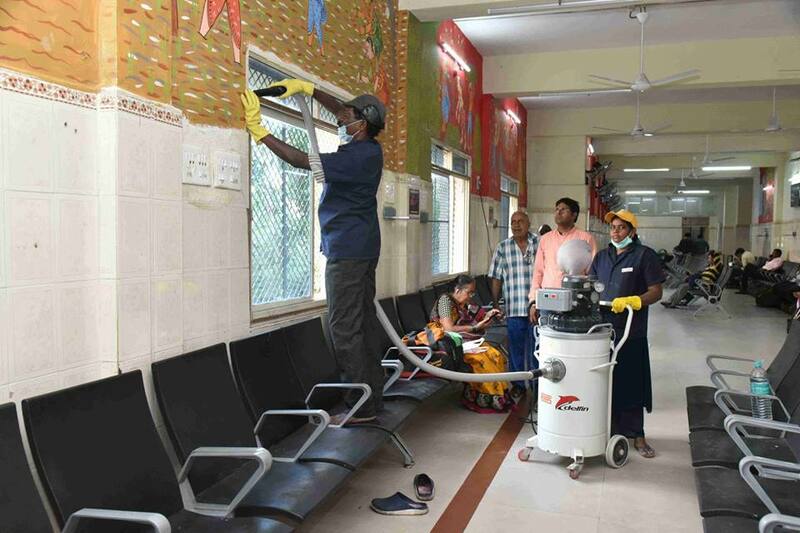 The OBHS facility is available on trains which include SMS requests for coach cleaning, electrical, linen, pest control, petty repairs, toilet cleaning and watering. Enhanced Energy Performance: 104 metal halide lamps have been replaced with same no. of LED lamps in coach maintenance yard, thereby having an energy savings of 68,255 kWh/ year. And 505 nos. of T5 fittings have been replaced with same no. of LED tube lights, thereby having an energy savings of 22,265 kWh/ year. The station has invested around Rs.7 Lacs and has achieved a savings of Rs. 8.21 Lacs. 25 occupancy sensors have been provided for lighting circuits in waiting halls, concourse area. 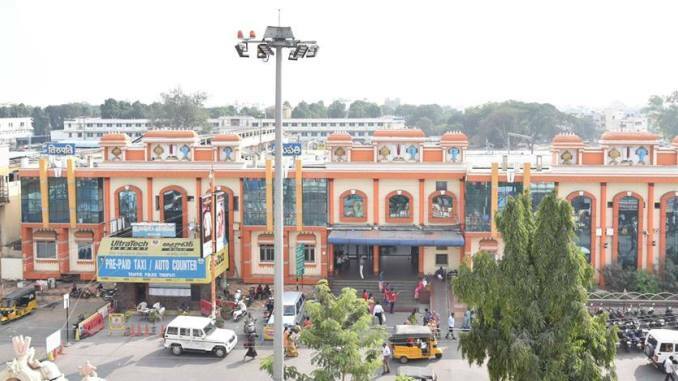 On site Renewable Energy: Tirupati station has installed 40 kWp rooftop Solar PV systems on roof sheds of platform. 11.7% of total non-traction energy consumption of the station is from solar PVs . Solar Water Heating: Installed solar water heating systems in place of electric geysers to meet more than 50% of the hot water requirement. Installed solar water heating systems at station which include 4000 LPD capacity. Water Conservation Measures: Water requirement for coach washing is 6.4 lakh litres/day. As regards water use reduction for coach washing, the station has got 4.0 lakh litres/ day treated water from Sewage Treatment Plant (STP). Waste Water Treatment: A waste water treatment plant with capacity of 4 lakh liters is implemented at station, which is meeting 62% of coach washing water requirement. Smart Passenger Services: Smart facilities have been implemented at station include Wi-fi facility, Automatic Ticket Vending Machine, Food court, CCTV surveillance, Smart Card ticketing Tourist information center and Prepaid cab booking facility. Green Outreach & Awareness: At station Green Awareness campaigns on Environment Day, Earth Day, National Energy Conservation Week, and Green Building Week etc. are carried and that the awareness campaigns are part of a regular practice. Innovation: The station has done exemplary performance in energy efficiency for 100% LED Lighting and IGBC has awarded points under innovation category for the same.